Free iOS and Android app. Transform your mobile device into a Roku remote. Browse and add new channels. Even use your phone or tablet to send your music, photos and personal videos** to your HDTV. Movies and TV shows, front and center. Instantly access the hottest blockbusters and hit TV shows, powered by M-GO, right from the home screen -- no extra account setup required. Revel in our fastest, most powerful streaming player yet. Fully loaded, the Roku 3 packs tons of entertainment into one tiny box. Enjoy 1,000+ channels of movies, TV shows, games, music, sports, and more. 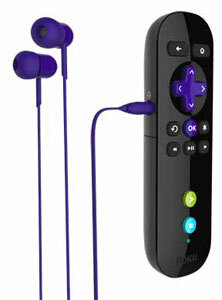 Plug headphones into the remote to watch late-night flicks without disturbing the household. 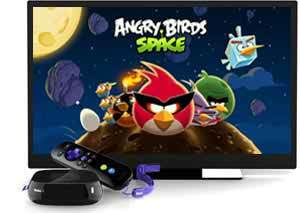 Or use motion-control to play games like Angry Birds Space. And with one-stop search, find that perfect movie or show in a flash. 1080p HD, dual-band wireless, Ethernet and USB ports, plus free iOS and Android Roku apps so you can enjoy even more great features. The Roku 3—the new streaming standard for your HDTV.